Time for another round of let’s-all-salivate-in-unison-over-all-the-dreamy-eats. I was working on behind-the-scenes stuff for Alchemy today so I took advantage of enjoying breakfast at home. The lovely ladies of Double Dose Bakery sent me their new grain-free blueberry waffles to try so I woke up pretty darn excited to faceplant into the box. The waffles are made primarily with eggs and coconut flour and lightly sweetened with raw honey, so they’re lower in carbohydrates than your typical waffle. They’re also free of gluten, dairy, soy, refined sugar, and preservatives. Can I get a hallelujah?! I tossed a couple in the toaster before topping them with more bloobs, drippy almond butter, and cacao nibs. They were absolutely delightful! I was pleasantly surprised that they weren’t too eggy or spongey like some paleo waffles can be. I’m excited to eat them again later this week! After working on a couple blog projects, I snacked on some celery with roasted garlic hummus plus an unpictured brown rice cake that I ate standing over the fridge. I think I eat 98% of my meals standing up. Before presenting a nutrition seminar on healthy eating for busy professionals, I slurped down a half caff iced coffee with soy milk. Once again, I forgot to take a picture. You’d think at this point I wouldn’t forget. My sincerest apologies. ….and a Zucchini Banana Baked Oatmeal Cup slathered with Wild Friend’s cinnamon raisin peanut butter. Arman thought it was funny that I whipped out my peanut butter at the coffee shop. I am what I am. After a very sweaty Body Pump sesh at The Fitness Loft, I gulped down a protein shake made with one scoop Vega Protein + Greens, a cup of water, a handful of ice, and a handful of frozen blueberries all blended up in the Nutribullet. Then I reheated leftovers for dinner, including Tempeh & Kale Enchilada Casserole with avocado, salsa, roasted asparagus, and roasted broccoli. I’m trying to limit the snacking I do after dinner because I tend to eat mindlessly when I blog, which definitely doesn’t make my racing mind go to sleep any earlier. I sipped on two big cups of sleepy tea and it actually really helped curb my snack cravings. That waffle! Those sound so good. I don’t necessarily bring my own PB everywhere, but I always always have snacks in my purse, so I’ve gotten looks for that before. Butttttt I’m just trying to avoid my hangry self! I need those waffles in my life!! I always consider ordering their waffles, but they are kind of pricey! They look delish though! I commented the same to Arman on his blog yesterday–it is so awesome to see the two of you together. I know what good friends you are. Have a blast together as I am sure you are!!!! Girl…you make veggie eating look so delicious! And I totally would have no problem whipping out a jar of nut butter anywhere. Take that Arman! Your waffle looks awesome. 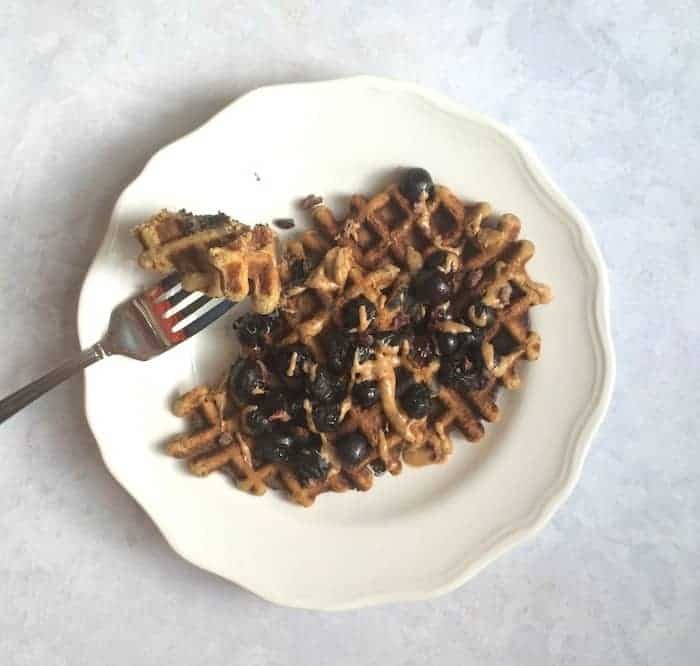 Blueberry is my favorite kind of waffle to eat:) I will take food out of my purse when my husband chooses to go to a fast food restaurant that doesn’t have something that I want to eat. I will eat a Quest bar or a piece of fruit. Having major waffle envy right now :) Thanks for sharing your eats! There are a very few things I keep in my bag/purse at all times. One of which being …peanut butter packs. You just never know when you’ll need to pull some out!! Man oh man I need to make that tempeh kale enchilada dish – looks perfect!! Thanks! Them waffles tho…. you sure got the delicious looking food thing down! I also love the shade of your smoothie- it is the most perfect shade of purple ever! You already look anorexic no need to limit your calories further. You eat very little, what a great example you’re setting! I was debating for a while on whether or not to respond to this comment because I don’t like to foster negativity on this space. While I do not suffer from anorexia, I work with several clients on a regular basis that do and I find your comment extremely offensive. Anorexia is a serious illness and your judgmental comment is not only hurtful, rude, and disrespectful, but it’s also untrue and completely unwarranted. I know many bloggers who no longer post What I Ate Wednesdays because of hurtful comments they’ve received such as this one. It’s a shame. While it’s quite obvious to me that Alexis is healthy it seems as though she doesn’t fit your personal definition of what healthy looks like. This certainly doesn’t give you licence to express this in a demeaning and hurtful way. Attacking people for what they look like fuels eating disorders and perpetuates the belief that there are physical ideals. I didn’t reply to shame you but only in the hopes that you’ll think twice before posting another comment of this nature because of the impact it might have on someone. I don’t understand why people are so mean! We all have different genetics and different bodies- often times regardless of what we eat and how much we workout. For someone to judge you solely based on what they see on your blog is just ignorant and unnecessary. DO YOU, girlfriend!